Five and a half hours. That is the amount of time it takes for Powersol charging umbrellas on Reynolda Patio to fully recharge. Two hours. The total amount of time it takes for solar-powered umbrellas to charge an iPhone from zero to 100 percent—the same amount of time it takes your typical wall socket. Over the summer, the Office of Sustainability, Hospitality & Auxiliary Services, and Facilities & Campus Services teamed up to bring five solar-powered patio umbrellas to the Reynolda Hall patio, allowing students to charge their small electronic devices with renewable energy from the sun. “The solar shades are a wonderful way of creating a charging source without doing major infrastructure work. The shades are movable with the furniture, allowing for enjoyment of the outdoors.” John Shenette, Associate Vice President for Facilities & Campus Services said. The Powersol charging umbrellas were developed by ZON, a company that provides solar-powered outdoor power solutions, to fill a void in the market and create a product that meets the demands of today’s typical mobile user. Sarah Akin, founder and Chief Creative Officer of ZON, recognized the need for an external connection between structures and outdoor spaces when she sat outside under an umbrella with her tablet slowly losing its battery life. Affixed atop the umbrellas, eight solar panels power a charging station that generates 54 watts of energy at any given time to three USB ports that can all be utilized at the same time. Even when the sun is not shining, the Powersol umbrellas retain stored power to allow charging of devices on overcast days or at night. 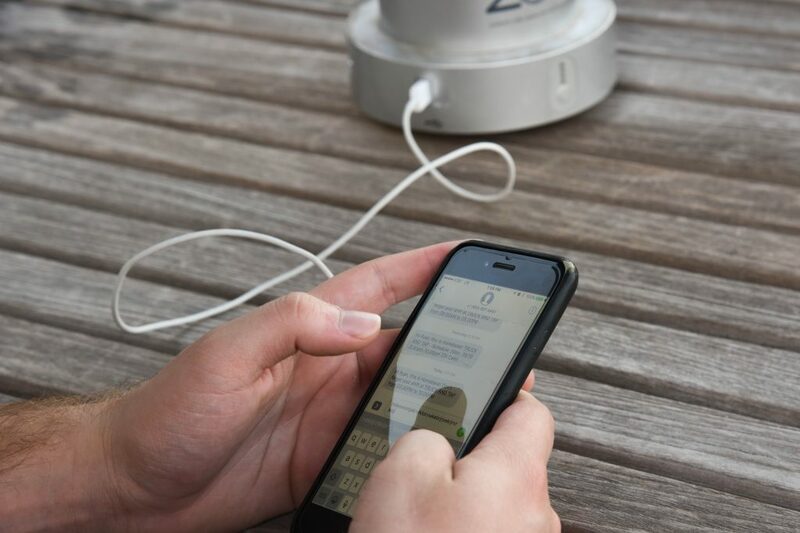 “I think it imperative that, in a time when basically every college student wants and needs charger access all the time, there’s outdoor access to chargers. The fact that they’re solar-powered and encourage people to do homework outside make them even better,” Wesley Skidmore, Office of Sustainability intern, said. Not only do the solar-charging umbrellas meet the phone-charging needs of students, faculty, and staff, but they also serve as a great example of the practical application of solar energy. “Being able to provide outdoor charging stations that utilize the power of nature is a win-win for everybody,” Shenette said. Make sure to try out Wake Forest’s newest solar-powered study and lunch spot on the Reynolda Patio.